My Kefir Grains Got Too Warm... Are They Dead? …we left a culture in or on the oven or stove. The oven or stove gets turned on and … oh, boy! Oops! If it's kefir, you'll find curds and whey, a stronger taste than usual, and maybe a bit cheesy. And what about the grains? Are they dead? Can they be saved? That's what we're discussing on today's #AskWardee. Check out the particulars below in print, podcast, or video. 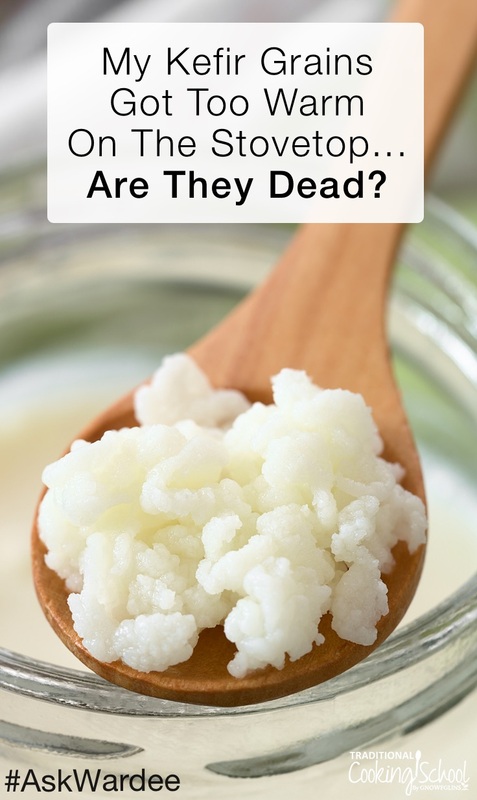 The Question: Her Kefir Grains Got Too Warm… Are They Dead? I have a friend who also started making her own kefir and she used to let her kefir ferment on her stove-top because it was warm. She forgot to take it off the stove-top while baking something in the oven and thinks it got too warm. The milk separated. After shaking it, it separated again, and didn't taste right. She is wondering if kefir grains can get too warm and kill the bacteria? When heated, the kefir separates into curds and whey and may taste cheesy or “cooked”. And, the kefir grains may die. Excessive heat kills them. It's hard to know for sure what happened with your friend's grains, Janet, because they weren't in the oven. (That would be way too hot for sure). Try making kefir again and see if the grains work or not. Does the kefir turn out like it used to? If yes, they may have survived! Are the grains shriveling away and appearing not to thrive — or do they maintain or keep growing? If the former, they're dead and need to be replaced. If the latter, maybe they're okay! That's a pretty short answer, but it's a pretty simple issue. Kefir is a fermented dairy that's similar to yogurt, except the mother culture is both beneficial bacteria and yeast. Yogurt is only beneficial bacteria. You can make kefir with raw or pasteurized milk. It's easier than yogurt, actually. Simply plop your culture (these dairy kefir grains) into a bit of milk, cover your jar, and let it culture at room temperature for 24 to 48 hours (adjusting up or down depending on the season of the year, temperature of your house, etc.). Then, remove the grains and put them a new batch of milk. Cover and refrigerate the finished kefir. What's in the grains, though? The beneficial yeasts and bacteria! They live in that rubbery, cauliflower-like matrix. When plopped into milk, they eat the lactose (milk sugar) and, in exchange, create the thickened, curdled, sour, bubbly milk we call kefir! 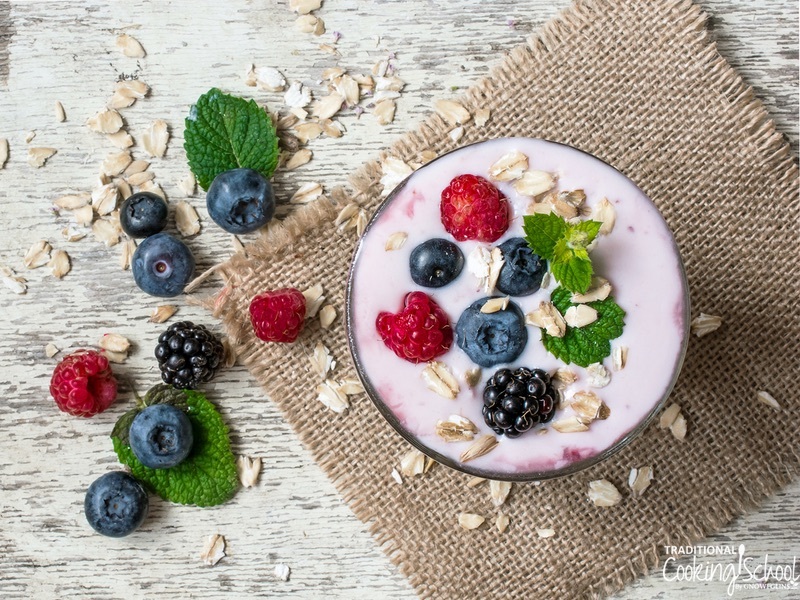 Kefir is full of probiotics and beneficial acids. It also has less lactose than milk. The longer it ferments, the more lactose is consumed. Wondering where to get them? My favorite source are these Dairy Kefir Grains from Cultures For Health! Free Thick Raw Milk Yogurt Recipe — it's faster and easier than most recipes, and you can make it with pasteurized milk, too! Have you forgotten a culture in or on the oven? What happened? Now I have a question. I recently started making kombucha. Am slowly replacing sugar with honey. I enjoy a cup every morning. My question, since the kombucha “mushroom” is yeast and bacteria, what is the difference between that and the kefir yeast and bacteria? Could I make kefir with one of my extra kombucha mushrooms? Unfortunately, you cannot start kefir from your extra kombucha mushrooms. Kefir and kombucha are both colonies of bacteria and yeast however the strains of bacteria and yeasts are different. What do you pair cheese with in place of crackers? (Like soft, cultured cheeses) How do you eat them? What are some other traditional uses for cheese? Also, what are so easy, yummy veggie side dishes? Homemade cheese is great paired with homemade bagels or grain-free crackers. Crispy, roasted (cooled) garden veggies…tomato, sweet potato etc. Amazin’ !